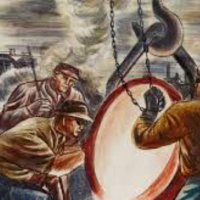 American artists produced a flood of depictions of working men and women during the 1930s, a time of mass unemployment and union organizing. In doing so, they created art that only partly captured how the industrial revolution and the growth of the service economy had transformed the nature of work over the past half-century. The paintings and sculptures in this installation will highlight forms of labor—growing crops, forging metal, cutting stone, and sewing clothes—that grew out of older traditions and relied on physical strength and manual skill. These proved to be more picturesque and heroic subjects than many purely modern jobs, such as office, retail, or assembly line work.